I’ve talked about Yelp before.It’s my strong feeling that while Yelp’s sales tactics are abominable, small businesses can get a great deal of business from Yelp. Well, I’ve discovered a Yelp marketing superstar that I just had to share. Two weekends ago, my friend and I visited San Francisco for a “food-cation”. We ate at great, cheap restaurants and had a wonderful time. One of the restaurants we went to was Burma Superstar. 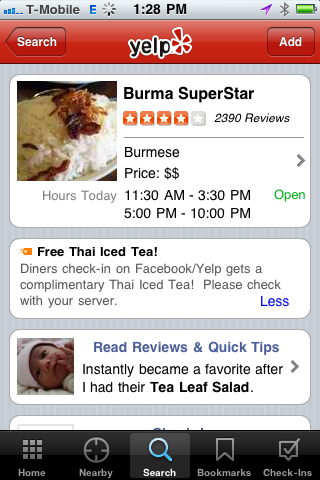 Burma Superstar not only has incredible Burmese food but amazing mastery of Yelp. Here’s why I’ve come to that conclusion. Let’s take a look at their Yelp mobile page. First off, notice their coupon. It simply says, “Diners check-on Facebook/Yelp gets a complimentary Thai Iced Tea! Please check with server.” Why is this brilliant? Well it probably helps to define checking-in first. This is when you use your smartphone’s GPS to verify your location and announce to the world where you are now. Every time you check in, your location is broadcast on Facebook, Yelp or Twitter. It’s a way to share cool bars, restaurants or businesses with friends. So, what Burma Superstar has done is to encourage you to share them with your friends and it only cost them a Thai iced tea. With great marketing like this, it’s hard not to see why Burma Superstar has so many reviews on their Yelp page. Currently clocking in 2,390 reviews, Burma Superstar not only exceeds the average number of reviews for ethnic restaurants but almost any restaurant in San Francisco. How can you steal what Burma Superstar has done for your own business? What can you give people for checking in? How can you promote yourself even more effectively?